Worldwide, especially in shamanic traditions, the most important tool for healing and other processes of changing energies is sound. Songs, words, drums and rattles are the “magic vibrations” to bring the personal spirit-power of the shaman together with his intention and his strong connection to the personal guide-spirits from his spirit world into the energetic field of the client who asks for help. 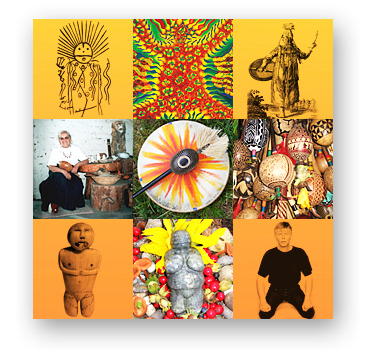 Prof. Felicitas D. Goodman (1914-2005) and Nana Nauwald (artist, author, explorer of shamanic cultures) collaborated in researching the effects of more than eighty different ritual body postures. – deep experience of healing energies, transformation, divination, contact to the spirit of ancestors. Depending on a certain body posture the practitioner gets the possibility to travel into different parts of the field of consciousness. The explored ritual body postures, when combined with the fast rhythmic stimulation of 210-240 beats per minute can lead not only to changes in somatic perceptions but also to visions, i.e. the “ecstatic experience.” Rather than constituting or promoting a particular belief system, or dogma, the body postures wholly incorporate the shamanic world view. If the rhythm is much slower than 210 b.p.m, it leads from the brainwave-research into a dream-state. In contrast to some other methods the Ritual Body Postures are a spiritual way and can give manifold experiences and visions in the alternate reality It’s not fantasy-world and not a dream state, it is the experience of “another reality” which is part of every human. These experiences give inner strength and the growing of the inner wisdom. The ecstatic trance is part of our genetic endowment. Ecstatic Trance helps us to integrate the knowledge and insight gained from the trance experience into our everyday lives. Practicing the ritual body postures can help us to access and energize our own creativity. The ritual of the body postures is combined with many different rituals in nature to open the senses of perception, to get more and more sure, that we are part of nature. Nature is our “life-mother”. To work with our huge inner abilities and to let them grow can create the deep-rooted feeling and knowledge that we always are part of the first creation, wherever we are. This insight does change life, brings joy, gratefulness, confidence and compassion in our lives.